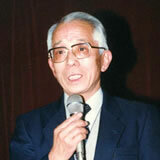 A student at Nagasaki Second Commercial School, Mr. Wada was mobilized as a streetcar driver near the end of the war. He was exposed to the atomic bomb explosion three kilometers from the hypocenter and was trapped under a collapsed building but managed to escape injury. He spent the days after the bombing assisting his friends. World War II came to an end on August 15, 1945. But for Nagasaki the war was far from over. The streets and neighborhoods were like replicas of a hell on Earth; the only remainders were a few dazed survivors scratching about the fields of death and destruction. I know it is not a rational question, but I still wonder why so many citizens and innocent children had been forced to suffer such atrocities and hardships. The sights and sounds of that time will be imprinted in my mind forever. It worries me to think that the passage of months and years tends to cloud memories and that the grave reality of the atomic bombings will eventually fade into the background. Now that more than six decades have passed since August 1945, postwar generations with no experience of war have become the majority. Although interest in Hiroshima and Nagasaki- the world's only atomic-bombed cities- is keen, direct knowledge of the horror and misery caused by nuclear weapons is reserved to a handful of people who were in the cities at the time and managed to survive. This fact makes the goal of nuclear disarmament seem even more difficult to achieve. It fills me with great fear and anger to think that the powerful countries of the world possess large numbers of these weapons of universal destruction. I left for work as usual on the morning of August 9,1945, thinking to myself that it was going to be another hot summer day. Arriving at the Hotarujaya Streetcar Terminal at six o'clock, I pressed my seal on the work sheet, showed my name plate, and then joined the line with my fellow drivers to receive a brake handle. After receiving my handle and the number of the car I was to drive that day, I walked to the depot to take up my position. During the morning rush hour my streetcar was crowded with passengers as I plied the standard route between Ohashi and Shianbashi. After the morning peak, I received word of a derailment at a certain point along the streetcar line and was instructed to change routes. Little did I know that this turn of events would save my life. It was just before 11 o'clock when I returned to the terminal at Hotarujaya grumbling over the fact that the accident had forced me to work longer than usual. Inside the terminal building, a fellow driver was being severely scolded by the company chiefs. It seems that he had been responsible for the abovementioned derailment. I went to have a bite to eat, thinking to myself how foolish it was to make so much of a minor issue, then sat down on a bench with my friends to discuss the cause of the accident. The hands of the clock showed 11:02 a.m. Suddenly the building was struck by a blinding flash of light and the impact of a violent explosion. The terminal was located three kilometers from the hypocenter but I thought it had suffered a direct hit. I seemed to float up into the air before being thrown down onto the floor. Everything became dark and I felt something heavy on my back. After a while, the surroundings came gradually into view. I was shocked at the extent of the destruction. As my fellow workers pulled me out of the damaged building, I breathed a sigh of relief to find my arms and legs intact. The sounds of people crying out for help finally brought me back to my senses. From that point onward I devoted myself to rescue work. However, every hospital and relief station in the city was jammed with seriously injured people. There were no medical supplies. All that could be done was to spread Mercurochrome or zinc ointment over the wounds and wrap them in gauze strips. Meanwhile, drivers and other employees of the streetcar company began to gather at the terminal. Some were badly injured, but all I could do was to comfort them with words. Girls and women were told to evacuate as quickly as possible. News that a terrible disaster had occurred in the Urakami area reached our ears. I immediately recalled the faces of three fellow drivers who had been heading in the Urakami direction when I came back from Ohashi. Numbers raced around inside my head as I tried to calculate their positions at the time of the explosion. I prayed silently for their safety. The road outside the terminal became noisy with passers-by. The people in the procession were so hideously injured that I could not bear to watch them pass. The sights of that day seemed to signal the last day of the world; "apocalyptic" is perhaps the only suitable way to describe it. When evening came I returned to my house and was relieved to find a note saying that my family had fled to the suburb of Tagami. From the hillside behind the house I saw that the prefectural office and City Hall were burning and that the area north of Nagasaki Station was a vast sea of flames. I stayed alone in the house overnight and returned to Hotarujaya the following morning. Reports had started to come in. Several employees, including the three drivers I had seen heading toward Urakami, were missing. For the next four days, we continued our rescue activities and searched for the missing employees, but despair quickly set in when we walked through the ruins in the northern part of the city. I believe it was August 12 when the mother of one of the drivers, a classmate named Hisao Tanaka, came to the terminal to inform us that Hisao had returned home alive. I ran with several other friends to the battered remains of his house, where he was lying in a corner room. We went up quietly to his bedside but were shocked to seer his disfigured face. He had suffered terrible burns and his gentle features had been frightfully distorted. He was barely alive. Words of comfort were pointless. "I didn't do anything wrong." These words passed the lips of Hisao Tanaka in a faint whisper as he drew his last breath. I remember the color of the smoke that rose from the funeral pyres we built for our friends. I remember the charred bodies of little children lying around the hypocenter area like black rocks. As if it was only yesterday, I remember the hundreds of corpses sprawled at the river sides for a last Earthly drink. Although in better health than most survivors, I also developed late effects during the months after the bombing. But it never occurred to me to complain about these things or to discuss them with others. I made up my mind to forget everything about that period of my life and never to say a word about the atomic bombing. It was not until 30 years later, when my first grandchild was born, that I began to recall the corpses of infants in the rubble after the atomic bombing and to feel a pressing duty to ensure that the atrocities of that day are never repeated. This is my incentive in speaking out against nuclear weapons and in relating my experiences to younger generations. A monument to the streetcar company employees killed in the atomic bombing stands today in a corner of Nagasaki Peace Park. Pausing to contemplate in front of the monument, I renew my determination to remember the gruesome deaths of the young drivers and conductors in their teens and 20s and many passengers, and to pass along the message of peace to future generations so that humanity can prosper without any threat to life and well-being.